According to Billboard, Chris Cornell's catalog of music — both solo and with his various bands — saw a sales gain of 2,396 percent in the two weeks ending May 18 and 25, as compared to the two prior weeks (ending May 4 and 11). Collectively, his albums and digital tracks sold 421,000 copies in the two weeks ending May 25, up from 17,000 in the two previous frames. In terms of on-demand streams (audio and video combined), his music tallied a 703 percent gain in the two weeks ending May 18 and 25, rising to 81 million streams from 10.1 million streams in the two previous weeks. 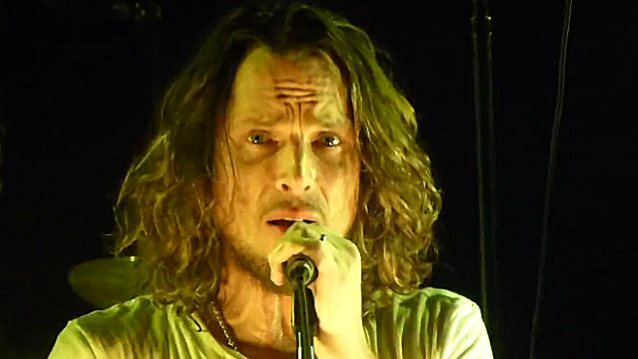 Cornell died in the early hours of May 18, the victim of an apparent suicide by hanging, shortly after SOUNDGARDEN played a concert in Detroit. Toxicology and autopsy reports are pending and will determine if the anti-anxiety drug Ativan, which Chris was taking, was somehow a factor in his death. In the days since Cornell's tragic death, a number of artists have paid tribute by covering his songs, including MEGADETH, DREAM THEATER, STONE SOUR, QUEENSRŸCHE, LIVE, THE PRETTY RECKLESS and HEART's Ann Wilson.